When Royalty visited the Dublin slums. | Come Here To Me! 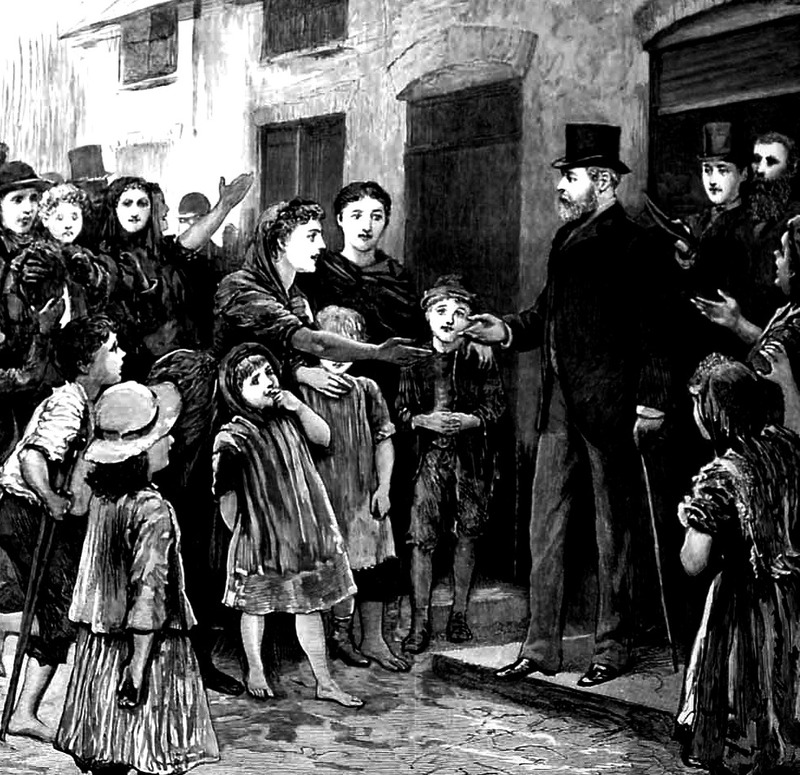 A contemporary illustration of a Royal visit to the slums of Dublin. The visit of Prince Albert Edward in 1885 was not universally welcomed, and Dublin Corporation voted by 41 votes to 17 against participating in the official welcoming of the Prince to Dublin. Yet while Dublin Corporation were rather hostile to the visit on the whole, one individual who seized upon the presence of the Prince in Dublin was Sir Charles Cameron. Cameron held charge of the Public Health Department of Dublin Corporation for over a half century, and was a tireless campaigner for improved health standards in the city. Cameron accompanied the Prince on a visit to the slums at Golden Lane, ironically located very close to Dublin Castle. I suggested to Earl Spencer, Lord Lieutenant at the time, that as the Prince of Wales had visited many model dwellings for the working classes, he ought to see some of the wretched dwellings in which the poor lived and which it was desirable should be replaced by healthy abodes. The proposal met with some opposition from the Prince’s entourage, but ultimately it was agreed that he would visit the slums, but strictly incognito. At 11 o’clock one morning, the Prince, the Duke of Clarence, and Sir Dighton Probyn left Dublin Castle in a plain carriage to visit, under my guidance, slums, and also the model dwellings erected at the expense of Sir Edward Cecil Guinness (now Viscount Iveagh). We went to Golden Lane, which was not far off. Just as we stopped at a large tenement house a woman discharged into the channel course a quantity of water in which cabbage had been boiled and which contained fragments of leaves. In getting out of the carriage the Duke of Clarence unfortunately stepped into this fluid, slipped, and fell. He was much startled, and his coat and one glove were soiled. We wiped him with handkerchiefs, and Sir Dighton, a man of almost gigantic stature, took o:ff a light overcoat and invested the Duke with it. As the Duke was of moderate height, the coat reached nearly to his feet. On entering the large yard of the tenement house, a ragged boy familiarly took the Prince by the arm and enquired what he was looking for. The Prince took all this, including the Duke’s contretemps, with great good humour, and in visiting the rooms he left something behind him which delighted its recipients. Victor, was there among the dwellers in the slums of the Irish capital, unannounced, unguarded by soldiers or police, trusting himself, with a manly and well-merited confidence, to the people themselves. Readily recognized, he and his son were, at every step, attended by words of welcome and by ringing cheers from those who, apart from political agitation, are as warm-hearted and loyal as any people in the world. In 1903, as King Edward VII, he once more visited the slums of the city, and it was noted that Lord Iveagh donated a sum of £50,000 to be distributed among the various Dublin hospitals, as a result of this visit and its impact. 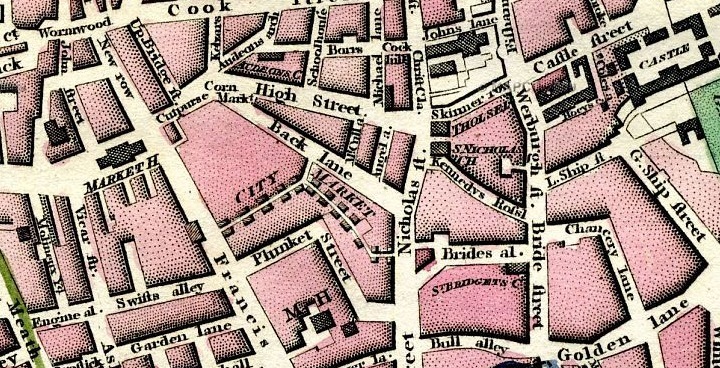 While these visits certainly attracted considerable media attention, the problem of slum housing in Dublin continued long into the days of Irish independence, and without famous visitors it went largely ignored. Great story – I never knew about this. Thanks. This is the role of an aristocrat,to help those who have no helper,and never ending to do some good things…and this Good for realy helping not for the image. I remember Ireland. I grew up in Dundalk on the border. I was there from 1933 to 1941 when I was taken to England. London. My days in ireland were happy days. Living in the slums many to a bed head to toe. Everyone was on welfare no one worked. The was TB in the family luckily I escaped it. We had little to eat. I had the arse out of my pants all the time . Had an old ragged jersey. Started school at 5 run by nuns they were brutal and caned us daily. That was my life till I was 8 then I was moved to London. I had been happy in Ireland my time in London during the war was miserable.